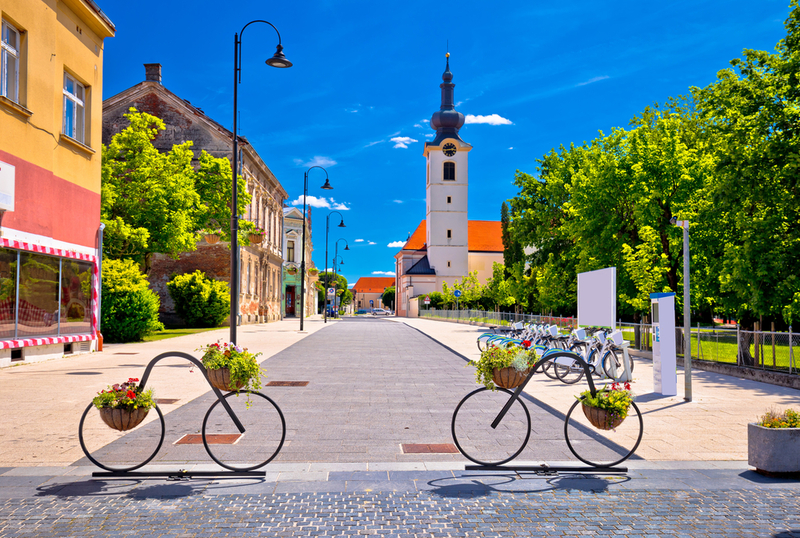 From the early 2000s, the City of Koprivnica in Croatia has had a history of implementing successful plans and actions to improve sustainable mobility. Indeed, in 2007, it won the prestigious European Mobility Week Award. In 2015, Koprivnica adopted a Sustainable Urban Mobility Plan (SUMP) – the first city in Croatia to do this. Before starting the SUMP development process, Koprivnica had been working on improving connections within the more central areas of the city to exploit the short distances involved. This allowed for a comprehensive regime of developing active transport (walking and cycling combined with public transport), resulting in a high modal share of 36%. In contrast, the city faced the challenge of a high volume of vehicles entering and crossing the city centre from a major national road, and a lack of public transport alternatives from more remote city areas to the centre. To address these challenges, Koprivnica set up and ran its own sustainable urban mobility planning process. As the pioneer of SUMPs in Croatia, Koprivnica had to draw on knowledge and guidance from EU-level materials, such as the European Commission’s SUMP guidelines, and from the CIVITAS DYN@MO project. As an early adopter of a SUMP in the region, the planning department of the City Administration developed its own processes and initiated the SUMP competence centre for South-East Europe. Koprivnica paid close attention to detail during the SUMP process. At the start, a mobility survey was carried out to accurately capture the mobility behaviour of residents and to determine their opinions and attitudes. Additionally, Koprivnica planned for training and capacity building to implement the measures outlined in the SUMP thoroughly. The city invested in public participation and made use of established knowledge from previous participatory planning processes through stakeholder workshops, awareness campaigns and establishing a transport forum. By July 2015, the SUMP was adopted by the City Council and entered the implementation phase with plans to start a city-focused public transport service in the second half of 2018 as a core element of the SUMP. The City of Koprivnica is in the north of Croatia. It has almost 34 000 inhabitants and is home to large food companies and a pharmaceutical industry. From the transport perspective, Koprivnica has major roads crossing the city including the TEN-T Mediterranean Corridor. These roads run directly through the city centre bringing about 24 000 vehicles per day. About half of these are required to travel through the narrow streets of the inner city. This results in major congestion during peak hours, reduced safety for pedestrian and cyclists, and heightened pollution from vehicle emissions – all of which combine to negatively impact the quality of life in the city. Koprivnica started to work on this situation early in the 2000s by initiating two, 4-year transport programmes - ’Town on the move’ started in 2002 and ‘Streets for people’ began in 2009. Both initiatives focused on the potential for cycling and walking due to the close proximity of most points of interest. Additionally, Koprivnica employed a Local Agenda 21 process in 2008, leading to the creation of participatory planning approaches. The City Administration also became active in European Mobility Week from 2002 onwards and was presented with the prestigious European Mobility Week Award in 2007. As a result of these combined initiatives, Koprivnica successfully raised the profile and share of walking and cycling as transport modes in the city. By 2014, 73.5 km of walking and cycling tracks had been built or designated and 78 % of the city’s children walked or cycled to school. In the city centre, the modal share of active mobility reached 36%. While walking and cycling by local residents were promoted successfully, problems arising from the national roads bringing a high number of vehicles into the city centre and visitors to the centre from more distant locations remained. One of the reasons for people travelling to the city centre by private vehicles was the lack of sufficient public transport. Passenger transport supply was confined to school and factory buses within the city limits. Train services and regional bus services were not integrated into the transport system and, largely, did not operate inside the city. To tackle the negative impacts arising from through and incoming traffic, combined with poor public transport services, Koprivnica joined forces with three other European cities in the CIVITAS DYN@MO project (2012-2016). One of the projects aimed was to create a SUMP for Koprivnica. Conditions for Koprivnica to start its SUMP process were mixed. On the one hand, national guidance and knowledge on SUMP processes were scarce. In fact, when it eventually adopted its SUMP in 2015, Koprivnica was the very first Croatian city to do so, which highlights the City Administration’s pioneering approach. To make the SUMP work, a change in planning culture and capacity creation was required. Work on the SUMP was largely based on the European Commission’s guidelines. On the other hand, Koprivnica could base its process on previous efforts to foster sustainable urban mobility, such as the working group on sustainable urban mobility from the European Mobility Week. The starting point for the process was a mobility survey involving residents in face-to-face interviews, online questionnaires and telephone calls. The survey was directed at the population in general, but was also reinforced by involving the largest employers in the city and getting them to encourage their employees to take part in the survey. The survey asked simple questions mostly based on ‘yes/no’ options. This enabled a higher number of questions within a concise survey. The resident survey also collected data to determine the current modal split. In total, 500 questionnaires were completed. develop the South-East Europe SUMP competence centre web platform and action plan. During the SUMP development process, 10 workshops with an extended stakeholder group and eight awareness raising campaigns for the public were carried out. These aimed to ensure the participation of residents and stakeholders, and to create a mobility strategy that answered all relevant transport aspects connected with spatial planning development, particularly to ensure the representation of vulnerable social groups including mobility impaired persons. The SUMP was adopted on 17 July 2015 by the City Council including a clear allocation of responsibilities, funds and resources. One specific task of the SUMP was to cater for training and capacity building of the staff involved to prepare for the actual implementation. A SUMP competence centre called the Southeast Europe Competence Centre on Sustainable Urban Mobility Planning’ was created to – among other things – foster good monitoring and evaluation of the SUMP implementation. As the Koprivnica SUMP development was part of the large-scale EU CIVITAS-DYN@MO project, the city was also able to benefit from using the expertise of external experts, academia and European peers. The overall aim of the Koprivnica SUMP is to improve traffic safety while reducing noise and air pollution by promoting walking and cycling as well as increasing the use of public transport and electric vehicles. increasing awareness of traffic rules and safety. As Koprivnica experiences a reduction in cycling during the winter season, the SUMP aims to reduce this seasonality and improve the already high modal share of cycling. introducing mobility management plans for the City Administration and city-owned companies. Following investment in five fully electric-cars, two hybrid cars, two fully electric minibuses and five fast chargers as part of the DYN@MO project, the SUMP outlines ways to establish an electrically powered public transport system, create electric-vehicle-based car-sharing services, roll-out a fast-charging system and develop a zero-carbon dioxide (CO2) university campus. All these measures go hand in hand with promoting the awareness and acceptance of e-vehicles. Transport and vehicle optimisation focuses on traffic flow and the use of space. This includes introducing a parking policy and parking management, traffic calmed zones, optimising deliveries and reallocating road space to sustainable modes of transport. Next to the immediate mobility objectives and measures, the SUMP sets out aims for its integration into the city’s main planning and implementation tools. This ensures the inclusion of the SUMP’s policies in annual and bi-annual construction and reconstruction plans, and wider land-use planning. Koprivnica’s SUMP implementation is now in progress and final negotiations for the installation of the proposed public transport service within the city are taking place. The aim is to introduce the new public transport service in the second half of 2018. The service has changed from what was originally planned. Fewer public transport lines will be introduced – just two, but with more frequent services. An on-demand service for children with special needs is also in the pipeline. The city will also implement a one-way street system for the inner city to address high traffic loads (the national roads that intersect the city are not within the planning power of the City Administration). The integration of measures from the SUMP into construction plans and programmes of the city is working as planned. One of the policies realised within this step is to create a cycling and pedestrian lane as part of any road construction work wherever physically possible. As part of the CIVITAS DYN@MO project, a sustainable mobility studies course has been introduced at the Koprivnica campus of the University North. The City Administration is making use of this special knowledge in its projects and is now about to launch a closer cooperation with the University as part of the Interreg Central Europe project LOW-CARB, which aims to put Koprivnica’s SUMP at the level of the functional urban area. This recent project will also see an involvement and upgrade of the SUMP competence centre. The City of Koprivnica’s SUMP development process provides a number of lessons. From a general perspective, one conclusion is to invest enough time and resources to first develop a good strategic preparation, and then to determine an action plan and implementation process for the creation of the SUMP itself. Moreover, the Koprivnica City Administration developed the first SUMP in Croatia with little national guidance and support. In 2014, the national Government introduced transport masterplans at the regional level. However, these were at the level of transport between the cities and towns of a region and did not deal with transport within the cities. For inner-city transport, masterplans for intermodal transport were introduced, but did not deliver appropriate guidance, since cities were not asked to deliver their view during the set-up of these transport masterplans. For this reason, the Koprivnica authorities had to rely on the European Commission’s guidance to SUMP processes. This was deemed a good source and basis by the city. Koprivnica added to the guidelines where necessary (such as the development of e-mobility). Koprivnica was the first city in Croatia to implement a SUMP and it had gathered a lot of information from outside of the country, thus helping to make it the ideal location for the SUMP competence centre. See http://www.kc-sump.eu/en/about-us/ for more information about the centre. The split of responsibilities for roads, as seen in many European countries, was and is a challenge for Koprivnica too. Responsibilities for core areas impacting the city, such as the national roads crossing the city centre, are not within the city’s power to change. Another challenge Koprivnica faced was the lack of funding for SUMP-related measures at a national level. Today, Koprivnica continues to be an active city in sustainable urban mobility planning as demonstrated by its role as the National Focal Point for Croatia in the CIVITAS Prosperity project and its work on SUMPs for the functional urban area in the Interreg Central Europe LOW-CARB project.